By posting in the discussion board, you have read and agreed to the rules in this thread. Take part in our exciting forum competitions! [Australia Day] Draw an Australian Landmark or Location. For all the hellos and goodbyes! Share your juicy findings here! WILL YOU GO ON A DATE THIS MONTH? 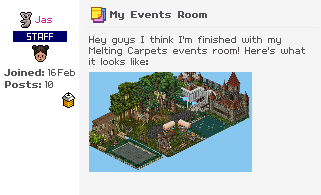 Show off your cool rooms, pixel art, or any Habbo-related content here! Have a burning question? 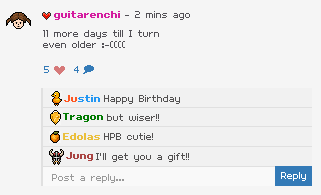 Get Habbo-related help here! Talk all things Habbo here! Anything else that makes sense! What is one website/app you wish you invented before anyone else? Saw something interesting in the news? Share it! Paul McCartney dreams about The Beatles! Share any travel related content here! What makes a good holiday? Discuss the latest celebrity gossips and hit music here! Get ready to drool in our all things food forum! All other technology related discussions. Your views on curiouscat, askfm etc. All things programming, and computers! Talk bits and bytes here. Lookout for code monkeys! Should we expect Windows 11 coming soon? For all the gaming freaks! Discover and share your gaming adventures! The world of photography! Share your awesome shots (no faces of course), and discuss all things photography!